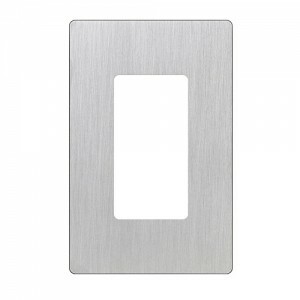 The Lutron CW-1-SS Claro screwless wall plate, 1-gang decora style in stainless steel fits any large toggle Lutron dimmer or light switch including those from Maestro, Diva, Lyneo, Pico, and others. This Lutron Claro® 1-gang wall plate stainless steel wall features clean lines and a sleek stainless steel finish that provides instant visual impact to any home. The screwless design mounts flush to the wall and is oversized to cover any gap between the wall box and the drywall. Made from high-quality thermoset, the stainless steel finish on the durable Lutron CW-1-SS wall plate will look like new for many years and can be cleaned in seconds. Installation is quick and easy, requiring only a few screws that cannot be seen once the finish plate is put in place. This unit can directly replace existing wall plates to provide homeowners with a quick upgrade that does not break the bank. The Lutron CW-1-SS wall plate includes a 1-year limited warranty from Lutron. Both CSA International and Underwriters Laboratories (UL) approve this product. Looks very good in kitchen with SS appliances. These have a very sleek clean look, love them.